While the world we live in may be a hyper-connected global village, humans remain creatures of uniquely distinct tastes and inclinations. While we may all exist on similar platforms and channels, use similar apps and sites, but despite the interconnectedness of it all, all humans behave differently from one another, and more often than not, uniquely so. And in the age of AI, it is now more easy than ever for content publishers and media entities to understand individual choices; to figure out what people like to read, listen to, and watch and how at that. 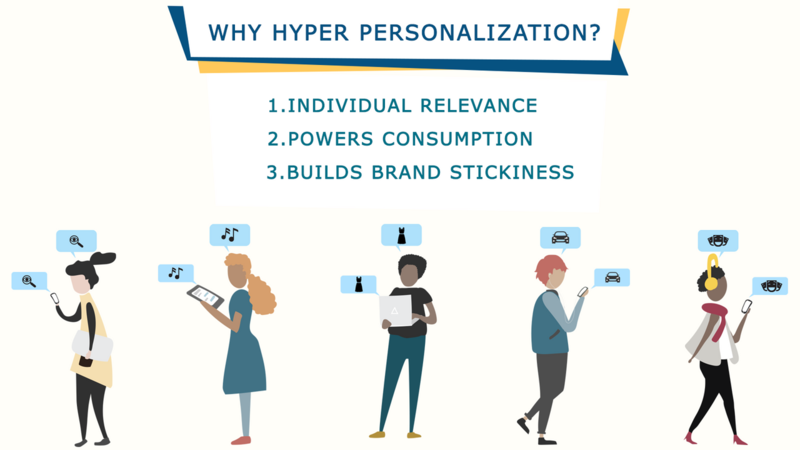 Hyper personalization is therefore about producing on-site experiences as unique as the fingerprints on a person. It entails, essentially, a deep dive – an attempt at exploring the complex psyche of your consumer, all in an honest effort to relevantly curate experiences that fit with their consumption patterns and also the [content] tastes and preferences on most days. And so, by delivering recommendations based on, say past searches and browsing patterns, a person ends up discovering ‘their-kind-of’ content easily. Prediction algorithms reduce the time and energy it requires for someone to arrive at content that’s relevant for them. When people spend less time searching for what they might like, they end up discovering and consuming content much faster and more frequently. When a platform ‘understands’ consumer tastes and preferences and provides content that matches individual sensibilities, consumers are far more likely to stick around on such a platform. Few content publishers get away with delivering broad-brush experiences. The fact is that unless your content universe is hyper-niche or that your consumers are all from the same flock, it’s unlikely you can continue to win with content crumbs that appeal-to-all, no matter how good the quality of the content. What you, the publisher and the marketer, must understand is that, content consumers are, invariably, convenience shoppers. They are most likely to use a platform that makes their life easy – as consumer – by recommending curated watch lists and playlists. The more the effort a consumer must put in to discover content, lower their affinity to the content brand. Assuming you have a wide pool of content to deliver to your audiences, being able to provide relevant content to your audiences is really just a matter of choosing the right content delivery tool. Plug-and-play tools featuring prediction algorithms and recommendation engines can help you accurately identify which piece of content a consumer can be interested in. Tools like Recosense’s pick on a consumer’s profile – their demographics, geo-location, browsing history, and consumption patterns (if-any) to deliver, in real-time, content that a user is most likely to consume. Based on the action the consumer takes, the tool learns and betters itself at recommending, getting more and more relevant each time. In addition to having a top quality tool and a wide variety of content, choosing the right segmentation parameters is the key to recommending well and recommending right. Experiment in the first couple to days to know where the gaps are and attempt personalized on-page experiences like a pro in no time.